Around the world, there is growing momentum around finding ways to reduce, capture and remove carbon from the atmosphere. But, did you know a key to helping solve one of the world’s most pressing challenges may be found right under your feet? 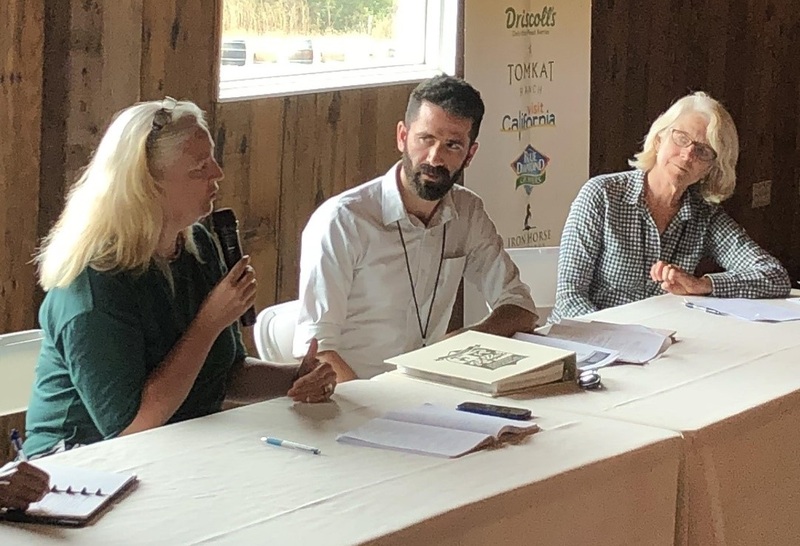 Gabriele Ludwig, ABC’s director of Sustainability and Environmental Affairs, spoke about climate smart almond growing at CDFA’s “Scaling Up Climate Smart Agriculture” event. On-farm practices like whole orchard recycling can help improve soil health and play a role in curbing climate change. One idea at the top of CDFA’s playbook is carbon sequestration. The theory is elegantly simple: withhold CO2 release to the atmosphere and store it in another form somewhere else. Research suggests that “somewhere else” could be the soil of an almond orchard, as well as the trees themselves. “A number of the current research projects funded by the Almond Board of California include assessing whether they also provide carbon sequestration in some form,” said Gabriele Ludwig, director of Sustainability and Environmental Affairs at the Almond Board. Ludwig spoke as part of a panel that addressed how commodity organizations are advancing on-farm adoption of “climate smart” agricultural practices. One area of interest for researchers has been whole orchard recycling. When trees are ground up and incorporated back into the soil, it’s believed that the amended soil not only sequesters carbon but can also lend other agricultural benefits. These include improved soil health and water filtration, increased water holding capacity, diversified microflora and increased nutrients and micronutrients. Other management practices that increase or retain soil organic carbon in agricultural soils are being assessed for how they can be practically applied to the almond production system. Some examples include planting cover crops, returning hulls and/or shells to the orchards, and applying compost. CDFA encourages practices that improve soil health and sequester carbon through its Healthy Soils Initiative, which brings together state agencies and departments to promote the development of healthy soils through innovative farm and ranch management practices. Almond growers can benefit from the initiative’s Healthy Soils Program Incentives Program, which provides financial assistance to growers who adopt eligible agricultural management practices. Climate change continues to gain more of the global spotlight. The recent Intergovernmental Panels on Climate Change (IPCC) report highlighted that agriculture was likely the fastest way to reduce greenhouse gases in the environment for the short term. Thus, CDFA’s efforts to include agriculture in the larger climate change conversation help to ensure agriculture remains relevant and that it has a voice. And for almonds, the research program of the Almond Board has been assessing the value of these practices — not just for carbon sequestration and emissions avoidance, but also whether these practices help almond growers and their trees. Those efforts, along with the success of the California Almond Sustainability Program (CASP), earned California almonds an invitation to CDFA’s international meeting. Events like “Scaling Up Climate Smart Agriculture” foster a dialogue in California where key industries can come together and develop sustainable paths forward. Securing a seat at the table for the California almond industry ensures we can share the work already underway to evolve production practices and what’s on the horizon.